The Italian Sabbatical is an opportunity to live and learn in a rural Italian village. For full disclosure, this is not a sponsored post. Although The Italian Sabbatical is sponsored by Airbnb in collaboration with an Italian non-profit called Wonder Grottole, All My Faves gains nothing from recommending the site to you, as usual. We simply want to point you in the direction of one of the most intriguing offers on the web, which could potentially lead you to a life-changing experience. The Italian Sabbatical is offering four people the chance to move to the small village of Grottole, Italy, in order to volunteer for a non-profit dedicated to rebuilding the historical center of the town. 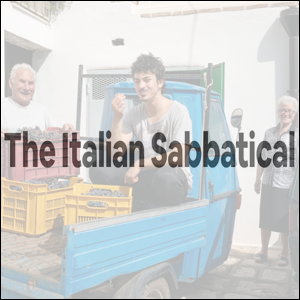 In addition to working for the non-profit (Wonder Grottole), The Italian Sabbatical will include a schedule of fun activities to keep you entertained throughout your three months in Italy. The itinerary includes Italian language lessons, working in the vegetable garden, taking cooking lessons, exploring the Italian countryside in an “Ape Car,” and relaxing with locals for an aperitivo. The experience aims to connect applicants with the local community as much as possible, and has the nice social initiative of helping to save the dying village. If you’ve got the time to dedicate to a new experience, head on over to The Italian Sabbatical and fill out the short and easy application.